Ben Dittbrenner, former NW CASC Fellow, PhD candidate in UW’s School of Environmental and Forest Sciences, and Executive Director of Beavers Northwest, is a coauthor on a new paper reintegrating the North American beaver in urban landscapes. This study examines how increasing urban beaver populations can be included in the design of new and established urban green spaces to improve ecosystem functions. It also identifies different management strategies and recommendations for how designers, planners and managers can incorporate urban beavers in project design. Ben recently spoke with KUOW about why more beavers are being spotted in urban areas around Seattle. He discusses how beavers are not new to the region but may be rebounding thanks to a law prohibiting the use of certain types of harmful traps. He also talks about ways to peacefully cohabitate with beavers in urban areas. Ben is also conducting research on how beaver activity in Northwest mountain streams could help to reduce the impacts of climate change on watersheds. Beavers, as ‘ecosystem engineers’, have the capacity to not only protect existing functions of an ecosystem but also buffer against future changes and habitat alterations. This research focuses on the use of beaver reintroduction as an adaptation strategy to address impacts of climate change on streamflow and temperature. The Tulalip Tribes, a research partner and funder of this project, will use the findings of this research to initiate and monitor beaver reintroductions within priority areas. Read this recent story about Ben’s collaboration with the Tulalip Tribe on this project. 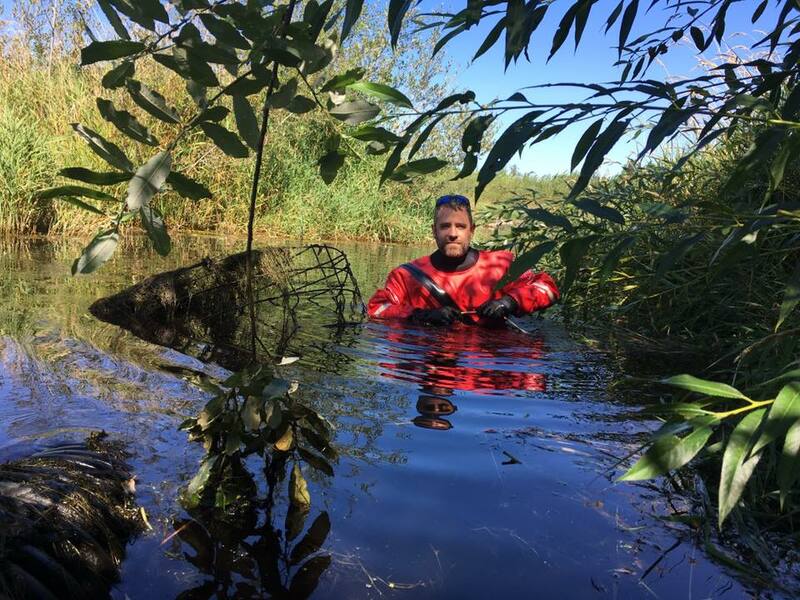 NW CASC Fellow Ben Dittbrenner evaluating a pond leveling device, used to manage beaver dams non-lethally.